What It’s About: Superman’s father (Marlon Brando) Jor-El tries to convince the council that governs the planet Krypton that it is doomed, but they refuse to listen or allow him to warn others. Jor-El constructs a spacecraft and sends his child off to Earth. The craft crash lands and the son is raised as Clark Kent by Martha and Jonathan Kent (Glenn Ford) in Smallville, Kansas. Jonathan teaches Clark to conceal his powers and wait for the right time to use them. When Jonathan dies, Clark (Jeff East)goes on a journey to the North Pole, where an image of his father teaches him about his powers and Krypton. Years pass and then the adult Superman (Christopher Reeve) flies to Metropolis where he joins the staff of the Daily Planet, a newspaper run by Perry White (Jackie Cooper). Jimmy Olsen (Marc McClure) is the chipper cub reporter; Lois Lane (Margot Kidder) is the star report who seemingly can’t spell to save her life. A freak helicopter accident gives Superman the perfect chance to reveal himself and save Lois. Soon he’s out foiling bank robbers, saving the president, and yes, even getting a girl’s cat out of a tree. Watching all this is Lex Luthor (Gene Hackman), a mastermind who lives in an abandoned subway lair. Aided by his bumbling henchman Otis (Ned Beatty) and his beautiful girlfriend Miss Teschmacher (Valerie Perrine). Luthor develops a plan. Can he outsmart the Man of Steel? Why Watch it Today? : Superman co-creator Joe Shuster was born on this date in 1914. 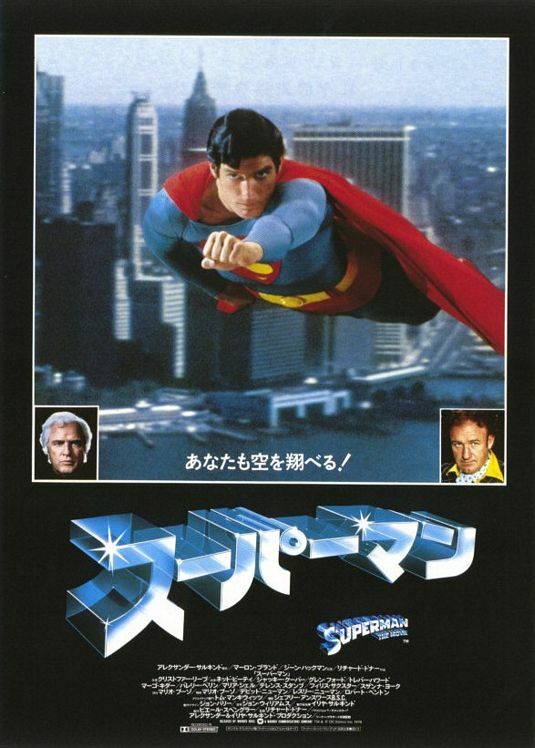 1978’s Superman is still the definitive live action version of the character, with its memorable John Williams soundtrack and Christopher Reeve’s memorable performance. Forget believing that a man will fly (that part is pretty dodgy these days in any case), you will believe a man can successfully fool his co-workers with nothing more than a pair of glasses and an entirely convincing dork act. This entry was posted in Adaptation, Aliens, Based on a Comic Book, Event Film, Movie of the Day, Remake, Sci-Fi, Superheroes, The Original and tagged adoption, before they were famous, Best Film Editing Nominee, Best Original Score Nominee, Best Sound Nominee, California, Christopher Reeve, dying world, father, father-son relationship, Gene Hackman, Glenn Ford, Harry Andrews, helicopter, helicopter crash, Jack O'Halloran, Jackie Cooper, Jerry Siegel, Joe Shuster, John Ratzenberger, John Williams, lady reporter, Larry Hagman, last survivor, Marc McClure, Margot Kidder, Maria Schell, Mario Puzo, Marlon Brando, mastermind, Ned Beatty, newspaper, nuclear weapons, reporter, Richard Donner, Sarah Douglas, Special Achievement Award for Visual Effects, subway, Superman, Susannah York, Terrence Stamp, Trevor Howard, Valerie Perrine, Warner Brothers.